From June 30 until July 31, I had the grace to visit the provinces of Ecuador and Argentina. For quite some time I had had the intention of visiting the priests of the Institute in Ecuador, who had kindly invited me several times to their province. For various reasons, until recently, I had not been able to make this trip. Now, by the grace of God, I was able to be with them for nearly two weeks, visiting all of our communities. I arrived in Guayaquil, where I could see the truly exponential growth of San Pío de Pietrelcina school, located in Guasmo, which now has 300 students, and has made huge improvements in its buildings. Moreover, the parish of San Luis Rey, also in Guasmo, is not only carrying on full-fledged work in the improvement of the church building, but also has a very active pastoral life, with various kinds of associations: groups of Bible study, university students, altar servers, etc. In the parish of Zamora Huayco in the Diocese of Loja, I again found a large growth in both the rectory and in the pastoral life. I also visited our dear El Gualel mission, where also significant improvements to the parish church are being made. In addition to the visits, I had the great joy of knowing the novices -to two of whom I imposed the cassocks- and the minor seminarians of the Institute. And I met with all the priests in the province in the town of Malacatos near Loja, where the novitiate building is located. I had the privilege of meeting with the archbishop of Guayaquil, His Excellency Antonio Arregui Yarza and the bishop of Loja, His Excellency Alfredo Espinoza J. Mateus, SDB. We also visited the bishop of Babahoyo, His Excellency Marcos Pérez Caicedo. In Ecuador, there is also the presence of convents and apostolates of the sisters, who are working very well, whom I was able to visit as well. 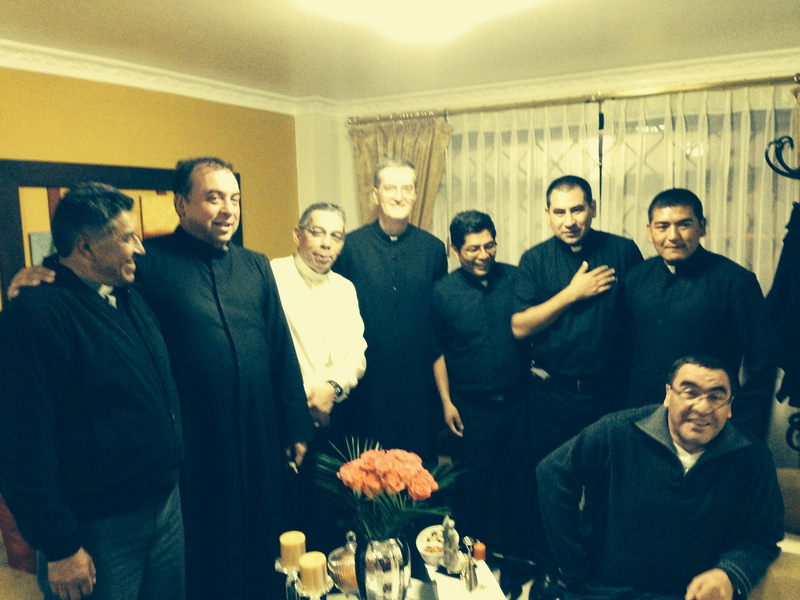 Our priests are working superbly in this beloved province, with great enthusiasm and many projects. I perceived an excellent relation of charity in their priestly fraternity and a very good relationship with the bishops with whom we work, as well as with the people of our parishes. By the grace of God, after visiting the priests in Ecuador, I was able to go to Argentina; there, among other things, I wanted to participate in the ordination of the then Deacon Tomás Bonello, at the hands of His Eminence Cardinal Theodore McCarrick, who traveled to Argentina from the United States just for this event. The ceremony took place on July 26 in San Miguel Cathedral, Diocese of San Miguel (Buenos Aires). In the city of San Rafael (Mendoza), I visited our seminary and some other houses: the Minor Seminary, the Monastery in Los Coroneles, the houses of charity of Saint Martin of Tours, San Juan Bosco and San Pío de Pietrelcina , the high school, and the parish of San Maximiliano Kolbe. It is very rewarding to see the growth of the work of the Institute in San Rafael. Also there I visited the contemplative monastery of the sisters and the Santa Catalina juniorate. On July 30, I visited the Apostolic Nuncio in Argentina, His Excellency Tscherrig Paul Emil, who was kind enough to meet me for about an hour at the Nunciature in Buenos Aires.